We have a professional and committed sales and service staff with many years of experience to satisfy all your automotive needs. 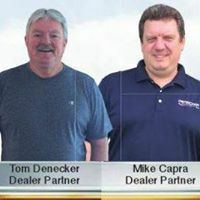 At Denecker Chevrolet, automotive expertise is a product of our continued interest in industry trends and product training! We are privileged to share the latest news, promotions and events with you and hope the information will enhance your shopping experience. As you know, there are many dealers from which to choose and we believe an informed customer is our best customer! We are happy to have the opportunity to service your existing vehicle or find the perfect new or pre-owned car, truck or van! We take anything in trade! We are the home of 100% Guaranteed Financing! At Denecker Chevrolet we treat you as our guest...not just a customer! Huge Inventory of New Chevrolet Cars, Trucks, Crossovers and SUV! GM Trained Sales and Service personnel! Modern, attractive sales and service facilities!